Sometimes covering vast swathes of land on heaths and chalk-downs. 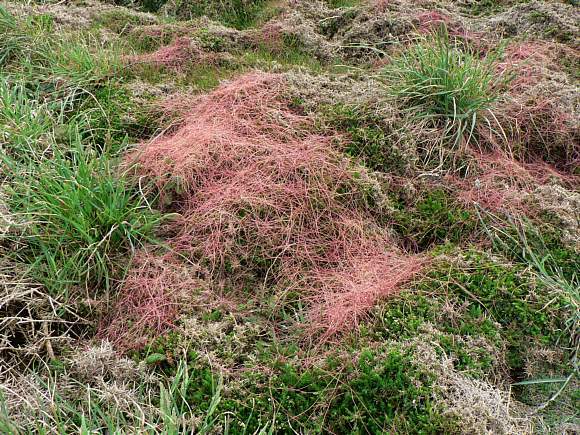 It just sprawls over the surface of other plants like pink spaghetti in a tangled mass. Sometimes draping from trees or shrubs it has attached itself to in order to harvest the nutrients, for, lacking the means to produce chlorophyll, it cannot photosynthesize itself. Here harvesting the nutrients from Gorse, its preferred host. parasitizing its favourite plant: Gorse. 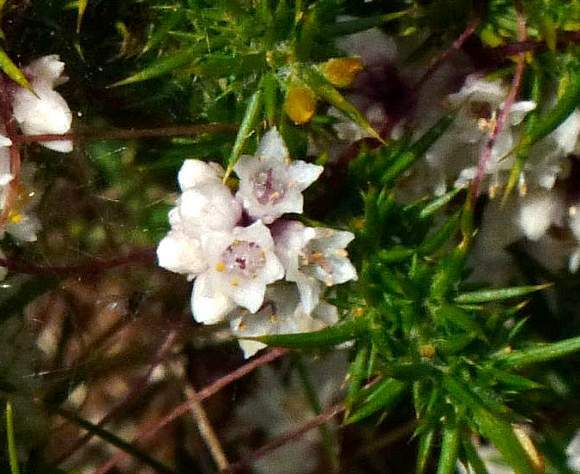 It has 5 white petals often tinged pink. The base of the flower has a beetroot-red colour. On Gorse. Five stamens each with a cream-coloured anther. On Gorse. 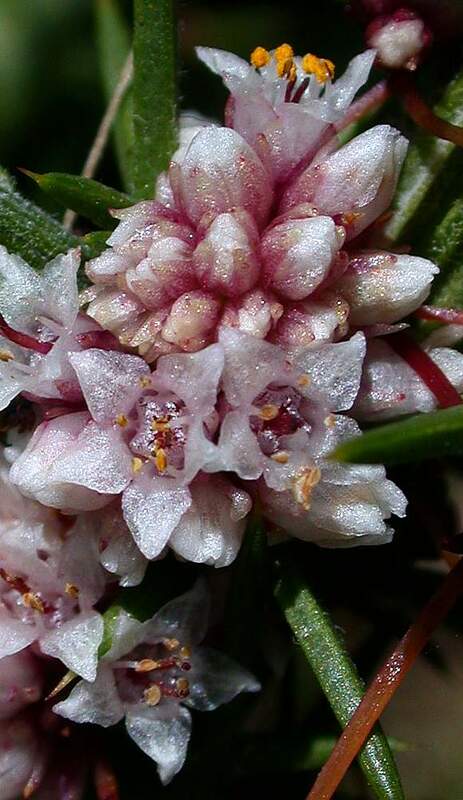 Flowers in globular whorls, each corolla 3-4mm across with 5 triangular lobes (petals). Has 5 stamens and two styles (here beetroot red). parasitizing Dyer's Greenweed (Genista tinctoria). Small unopened flowers are deep-red. Growing larger they pale through pink to white. On Dyer's Greenweed (Genista tinctoria) Fully opened the flowers have lost all colour but faint washes of pinkness. Apart from the anthers which are yellow. 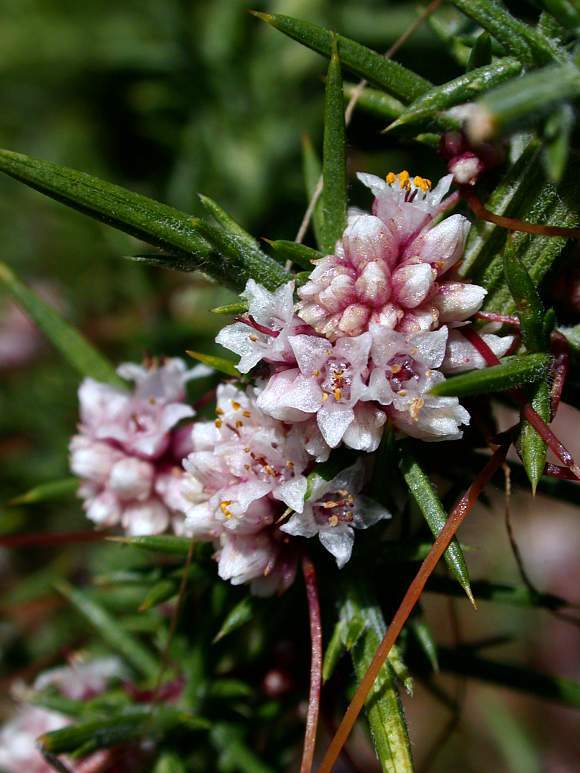 As well as Gorse, Dodder other favourite plant to parasitize are Caluna species, Heather which it is entangling itself with here. On Gorse, it's favoured meal. On Gorse, it's favoured meal. Pollen deep-yellow. Normally with 5 petals and 5 stamens, which may or may not slightly poke out beyond the petals. 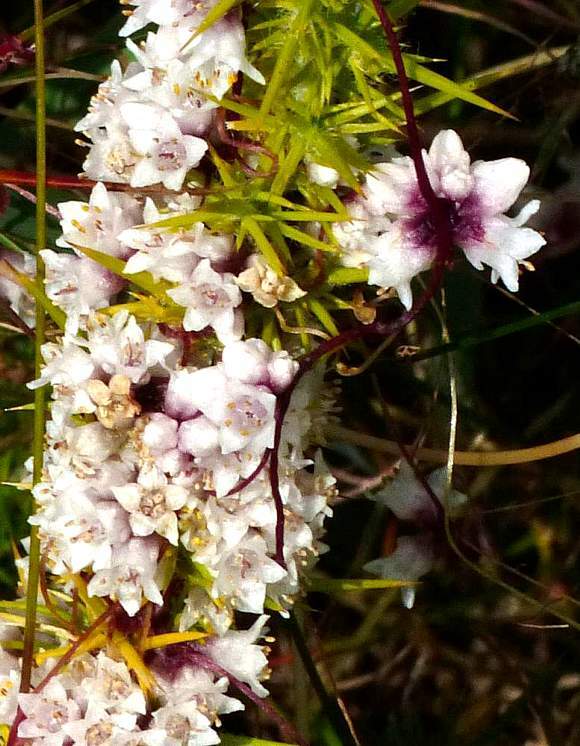 There are 2 styles on all species of Dodder, you can see the two on the flower just left of centre as two clear wire-like rods sticking out from the 5-lobed star within the flower. The 5 sepals are shorter than opened flowers, pale pink to white, and best seen on the unopened flowers in the top half of the photo. Distinguishing Feature : Pink spaghetti-like long tangles of thin threads weaving through undergrowth, twinning on suitable host plants. 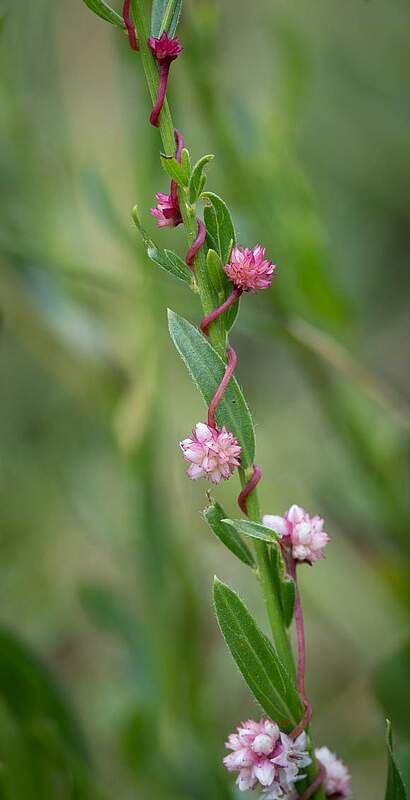 It is an annual with thin (c. 0.5mm diameter) pink spaghetti-like long stems (over a metre) and grows on heaths and limey chalk-downs in the South of the UK, especially Cornwall and through Hamps, Somerset, Kent to East Anglia. The small flowers are in globular clusters every so often along the (long) stems like whorls. They are white to pink, perhaps beetroot-red in places. It is declining and is listed as vulnerable. Although your Author has given it a heading of a 'climber' (on account of the coiled spirals that wrap and tighten their grip on host plants) it does not seem to be able to climb by means of the tendrils, although it can hang from the branches of trees and shrubs by this means. 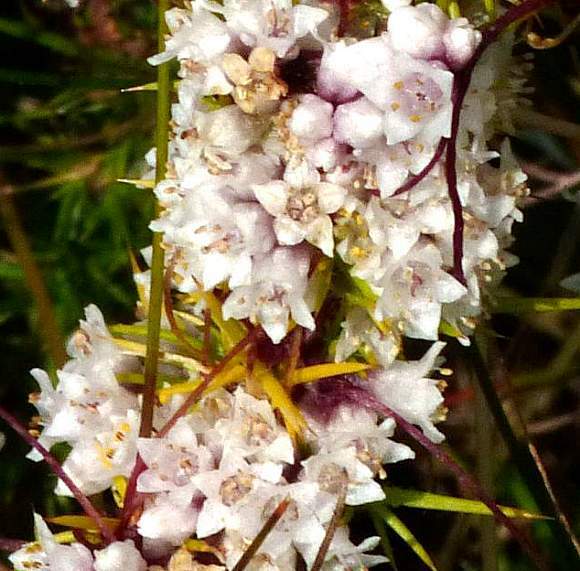 Unable to synthesize chlorophyll, Dodder is a hemi-parasitic plant which is parasitic on other plants an depends upon them for all its nutrients. It sprawls all over suitable plants, tapping into their resources via haustoria which insert themselves into the host plants. It twines anti-clockwise around the host plant, tightening the loose coils as it does so which initiates the growth of the haustoria on the coils to tap into the plant. 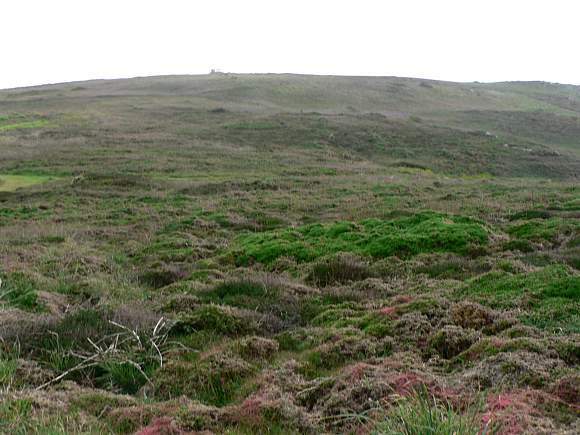 The host plant is usually Gorse, but Heather and Wild Thyme are also likely hosts. After tapping into the host, the plant continues to grow loose spirals until they too find a host and the coils tighten again to gain nutrient contact. Dodder plants do initially possess their own roots, but they soon die off once they have tapped into the food supply of a host plant. If, however, the Dodder fails to find a suitable host within 2 to 5 days of germinating from seed, then the Dodder will die. Once it is successfully attached to a host plant it will grow and spread to cover other distant plants, possibly tapping into those too. Although an annual itself, if it taps into a perennial galls can form at the attachment areas over the winter, and when spring arrives new Dodder plants can develop from these galls. 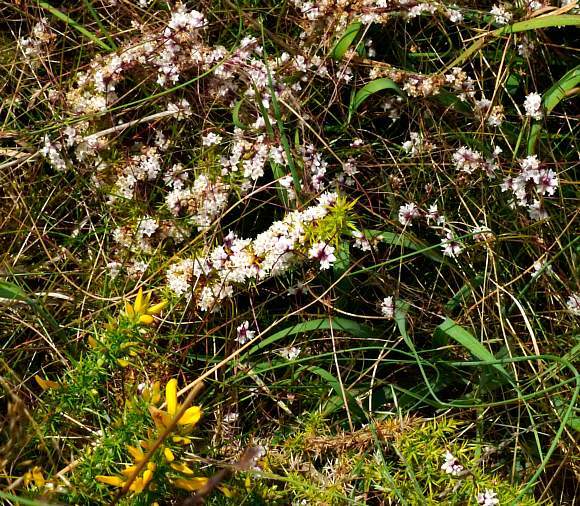 Dodder detects the presence of certain desirable host plants by the volatile organic compounds that the host produces, and is able to home in on the host plant, wrap its tendrils around it and tap into it if it deems the host beneficial. But the host plants are not defenceless in this attack, and often synthesize deterrent and toxic molecules (phytoalexins) in response. Dodder does possess leaves, but they are minute and scale-like, and, lacking chlorophyll, not green. There are several other Dodders, one, Greater Dodder (Cuscuta europaea) ([RR]) is rarer than Dodder ([R]) and prefers Stinging Nettle (Urtica dioica) (but unlike Dodder is able to parasitize almost any other plant within reach) but Yellow Dodder (Cuscuta campestris) is apparently not rare but rather a non-native garden escapee which prefers to parasitize Carrot . 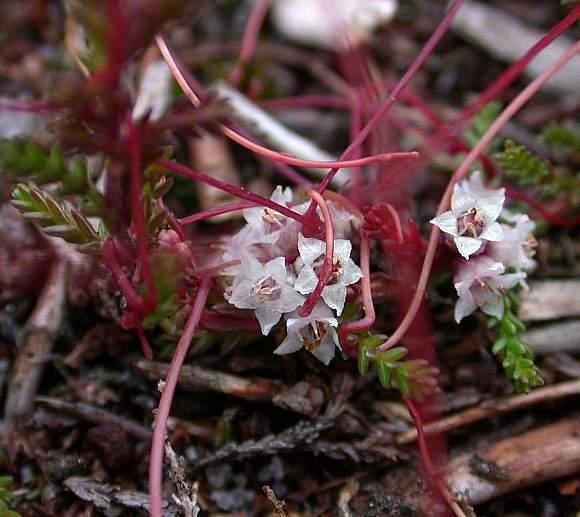 Somewhat surprisingly, some parasitic plants are able to parasitize themselves, a phenomenom called self-parasitization. Species of Dodder are one such, Mistletoe too in some instances. 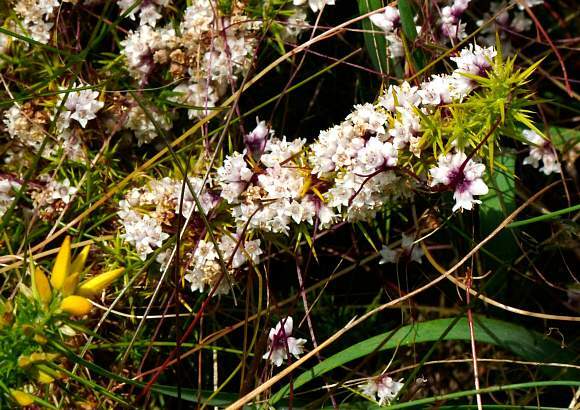 There are reports that Dodder smells foul (reminiscent of rotting fish) when it is flowering and those flowers are ripe for pollination. At other times there is no detectable odour. One of it's colloquial synonyms is 'Devil's Guts', which explains a lot. Rotten fish smells of amines, so Dodder must emanate amines during those periods. It seems that the plant uses the rotting smell to attract blow flies which will then pollinate the plant. One of those amines could well be either Putrescine or Cadaverine or even both together.